Minister of Sports Dayasiri Jaysekera is to seek Cabinet approval for a pension scheme for all sportsmen and sportswomen who had brought fame to Sri Lanka. The Minister came out with this plan of his in response to a question raised by the MPs in Parliament on the issue with regard to Olympic Medal winner Susanthika Jayasinghe who is in the centre of a controversy currently over a plan to auction her silver medal. “We have to think of other Sri Lankan sportsmen and sportswomen who had kept the country’s flag flying in the past as well other than Ms. Jayasinghe. Therefore, I have decided to submit a paper to the Cabinet seeking its approval for a pension scheme for all sportsmen and sportswomen who have brought fame to the country,” the Minister said yesterday. “There are other athletes such as Sriyani Kulawansa, Damayanthi Darsha and Sugath Tilakaratne who have won medals even at the Commonwealth Games. We cannot cater to Susanthika alone when there are others who have done their job for the country,” he added. 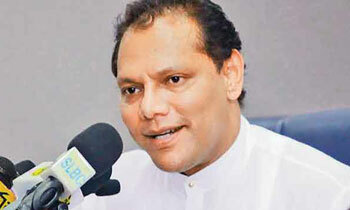 The Minister said the Ministry of Sports paid a sum of Rs 60,000 to Ms. Jayasinghe while the Army also paid an equal amount. However, he said the payment was suspended as she failed to provide an activity report as an adviser to the Ministry. One Kg of sugar will become Rs 3000.00 when the pension paid to every one. Good move sir, if this was in place Susanthika will never think of auctioning her medal to raise money for her survival. Again, Thanks to our 'Black Mare'! THEN SUSIE WILL NOT SELL HER GOLD MEDAL AND STAY IN SRILANKA FOREVER. So is it okay to pay millions and millions monthly rent for an unoccupied building? and for how many years? Kata thibunata, Susie kellata biyauna wage. What an irresponsible statement to make, sportsmen like the rest of us must make financial contributions to earn their pensions. Politicians should understand that state coffers is not a private property to spend it willy-nilly without any accountability.